This article provides in-depth fundamental analysis of Wonderla Holidays Ltd, a leading player in the Indian amusement park industry with operational parks in the cities of Bangalore, Hyderabad and Cochin. Wonderla Holidays Ltd is in the amusement park industry. An amusement park is a generic term for a collection of rides and other entertainment attractions, assembled for the purpose of entertaining a large group of people. The oldest amusement park in the world is Bakken, north of Copenhagen, Denmark, which opened in 1853. The global amusement park industry is $25 billion and is dominated by the US which holds 50% of the pie. The US is followed by Asia pacific (27%) and Europe (20%), Canada and Latin America form a small portion of the global market. Global footfalls in 2011 were 196.3 million for the top 25 parks. This was an increase of 3.8% over the previous year. The North American market grew 2.90%, Asian market by 7.50% and European market by 2.8% in the year 2011. The Indian amusement park industry is 2600 Cr and there are 150 amusement parks in the country. The annual footfall for the industry is 58-60 million. This is expected to grow 10-15% in the next 5 years. Investments to the tune of 17500 Cr are lined up for 12 parks, the largest being the one in Surat which is to be set up at a cost of 10000 Cr, it is a joint venture with Atlanta Ltd and is spread over 3200 acres. Peak season for parks is the March to June and October to December months. Kids are the major target segment of amusement parks and school vacations and festivals like Diwali and Christmas are when kids would visit the parks. Parks like Wonderla, Essel World and Nicco park fall into the large park category. These parks provide a combination of dry & wet rides, restaurants, eateries. Some large parks also provide resorts, spa, banquet halls, and golf course as additional facilities. Sources of revenues for the parks are entry fees, food & beverages (F&B), retail products, sponsorship and advertisements, resorts and other miscellaneous rentals. In India major revenue for the parks is in the form of entry fees about 75-80%, F&B and merchandising contribute about 18-23% and resorts and other rentals about 2%. Parks globally receive 31-35% of their revenues from entry fees, 32-35% from F&B and 35-37% from the resort and other rentals. When compared to their global peer’s Indian parks have a lot of catching up to do in the F&B and resort rental space. Parks in India charge either single entry fees, pay as you go option or separate fees for dry and wet rides or a combination of the above. Major drivers for amusement parks in India are demographic advantages, 28.5% of the population lies in the age group of 0-15 years, 63.40% in the 15-59 and 8.10% >60 years. Rising income levels, increase spending on tourism and leisure activities & rising urbanization are the other factors that will lead to more people visiting amusement parks. Wonderla Holidays Ltd is one of the largest operators of amusement parks in India. They currently have three parks in Kochi, Bangalore & Hyderabad and resort in Bangalore. Mr. Kochouseph Chittilappily who had incorporated V-Guard industries in 1996 set up the first amusement park in 2000 by the name of Veegaland in Kochi. Veega holidays and parks private Ltd which ran the Veegaland park merged with the company on 1st April 2008 and after that, the Kochi park is operated under the name Wonderla. Wonderla Kochi is situated on 93.17 acres of land, and currently, only 28.75 acres is being occupied for 56 water and land based rides. They also have 7 restaurants in Kochi. The second park was set up in Bangalore in 2005 by the name of Wonderla. Wonderla Bangalore is situated on 81.75 acres of land and currently, 39.2 acres is being occupied for 55 land and water rides plus the resort. They have 7 restaurants in the Bangalore park. The company has a resort in Bangalore. The resort was set up in March 2012 with 84 rooms with a capex of 28 Cr. The resort provides amenities like banquet halls, conference rooms, restaurants, gym to name a few. The intention of setting up the resort was that the customer has an extended stay to enjoy the amusement park thereby also increasing customer spend. The management in its latest concall has expressed its interest to set up a resort in Kochi in the near future. The third park was set up in Hyderabad recently and the park has started generating revenues from Q1FY17. The company has acquired 49.57 acres of the Hyderabad park for 25.47 Cr. The company has used only 27 acres for 42 land and wet rides. The company is in the process of acquiring land and setting up one more park in Chennai. After the Chennai park has been set up the management intends to set up one new park every 2-3 years. The parks will be funded through a combination of internal accruals and debt. The Hyderabad park is set up at a total cost of 256 Cr. Below is the breakup of the costs involved in setting up the park. This should give an indication of the various costs involved in setting up of the park. 32 Cr for water based rides. The company has an in-house team which designs rides and is a huge source of competitive advantage when compared to its peers. I will cover this in detail later in the report. The company follows the IS 800-1984 (code of practice for general construction in steel) and EN – 13814 (European standard) in designing and selection of amusement rides. It is then very important that the investor buys a wonderful company at a fair price. Source of competitive advantages can be if the company has low input costs, proprietary technology, patents. Customer preference for the product is also a strong source of competitive advantage and can be achieved through strong customer habits and higher switching costs. Network effects can also be a source of a strong competitive advantage. It is for the investor to identify and sources of competitive advantage that a company may have and check to see if these advantages are not eroded. If a company has a strong competitive advantage and earns high returns on capital, it is natural that it will attract competition. It is companies that are able to negate this threat and continue earning high returns on capital that create shareholder wealth and an investor must identify and buy these businesses at a fair price. After studying the company, I believe Wonderla Holidays Ltd has the below competitive advantages. The amusement park business is capital intensive. Companies that operate in this space need to spend money for setting up new parks, spend for new rides every 2-3 years to attract customers and get repeat footfalls and spend money for maintenance aka maintenance capex every year. It is difficult for a lot of parks to survive and thrive in the same area, hence the companies that have set up parks in a particular area have a first mover advantage. Let me explain this with help of an example. Wonderla Holidays Ltd has two established parks in Kochi and Bangalore. If any competitor needs to set up a park near these locations they need to spend money on rides and equipment for which Wonderla has already spent and those assets must have been depreciated fully. Also, land prices have gone up since the time Wonderla set up its parks and company will have to pay the much higher price to acquire land. It is also not easy to acquire huge parcels of land. If one assumes that the company has deep pockets and is able to set up a park in one of these locations it will take a lot of time for the company to break even and the company cannot price its tickets higher than the competition. Wonderla Holidays Ltd has been very strategic in setting up its parks in good locations. Its latest park in Hyderabad also does not have any major competition. The catchment area for such huge parks as Wonderla is in the range of 250-300 km. Hence it is very difficult to penetrate markets where Wonderla already has a presence. The company has an in-house manufacturing facility at Kochi to manufacture amusement rides. This is in addition to procuring rides from manufacturers in India and outside India. The company is always on the lookout for developing innovative rides. The company sends its key staff to amusement parks across the world to observe new trends, this exercise helps them to conceptualize new innovative rides, thereby enhancing customer experience. As Of January 31, 2014, the company has manufactured 42 rides for its parks. The cost advantage is huge if a company manufactures its own rides, the cost is 1/3rd the cost it would have to pay if it procured the rides from external vendors. The Company is aware that to attract footfalls and have repeat customers it has to innovative and provides new attractions to customers. For this reason, it introduces one new ride every 2-3 years in its parks. As mentioned above it also sends its staff to parks across the world to observe trends. As a result of these efforts, the Park in Bangalore is ranked #1 amusement park in India and the Kochi park #4. The Bangalore park is ranked #8 and the Kochi park # 15 in top 25 parks in Asia. These positive reviews and happy experiences would also have a rub on effect on people wanting to visit the park. The company is also aware that accidents could result in adverse publicity to the park and hence it has strict maintenance procedures in place. The company has had nine accidents in its parks which have resulted in legal proceedings against the company. There are only 4 outstanding at the time the company filed DRHP. Mr. Kochouseph Chittilappilly is the founder, promoter and non-executive director of the company. He is also the founder of V-Guard industries and is currently its chairman. Mr. Chittilappilly is also the founder of the Thomas Chittilappilly Trust. The trust provides health insurance cover for over 2300 families from financially backward classes across Kerala, Karnataka and Tamil Nadu. Mr. Chittilappilly also did something very unusual in 2011 unheard of in business circles. At the age of 61, he donated one of his kidneys to save the life of a truck driver. This was done in spite of protest from his family and discouragement from his doctors. Mr. Arun Chittilappilly is the son of Mr. Kochouseph and the managing director of the company. He is a masters in industrial engineering from industrial research institute of Swinburne university (IRIS), Melbourne, Australia. He initiated the Bangalore park project in 2003 which was completed by 2005. There is also a clear demarcation between Wonderla Holidays Ltd and V-Guard, while it is Arun Chittilappilly who is the MD of Wonderla, Mithun Chittilappilly is the MD of V-Guard. One more measure to check management integrity is to see what their remuneration is when compared to the net profits the company earns. The below shows the remuneration drawn by senior management at Wonderla Holidays Ltd, the compensation drawn is reasonable. The management sells all packaged foods, aerated drinks in the park at MRP. This certainly tells you something about the management, they can easily sell these above MRP and no one can question them and people will pay up for these, as they do in the cinemas. However, the management has a policy of selling all the products at MRP. There is a superb piece written by Prof. Sanjay Bakshi titled “Seven Intelligent fanatics from India”. Prof Bakshi teaches at MDI, Gurgaon and is an authority on value investing. In this article, he writes about people who run businesses which have rewarded shareholders handsomely and the qualities that these people possess. He calls them intelligent fanatics. “If you get an opportunity to get into a wonderful business that’s being run by an intelligent fanatic and if you don’t load up, it’s a big mistake”. Are the promoters of Wonderla Holidays Ltd then Intelligent fanatics? I think so and I substantiate the same below. The copyright “Wonderla” and patent for an invention was assigned to Mr. Kochouseph Chittilappilly and he has assigned the copyright and patent in favor of the company for a consideration of Rs 2000.This certainly tells you about the integrity and quality of people who are in charge of the company. The promoters of Wonderla Holidays Ltd certainly have energy, and there is also intense focus that they have, which usually other promoters don’t have. The promoters are focused only on setting up large parks in the country and expanding their reach. Apart from the 3 parks that they have, their plan is to set up a park in Chennai and after that, they want to set up one park every 2-3 years. They are very clear that these parks will be located on the outskirts of the city and will be large. In fact in the recent concall Mr. Arun Chittilappilly when asked about whether he wants to set up small centers in the city so that the brand visibility of Wonderla would increase said that he is not interested in such an exercise and his sole focus is to set up the kind of parks that the company currently operates into other parts of the country. Forget about other businesses, the company is not even interested to set up small entertainment centers which would enhance the brand visibility of Wonderla. This certainly tells you the focus with which the company is going ahead. “The difference between successful people and really successful people is that really successful people say no to almost everything”. As an investor one would like to partner with intelligent people who run the business, how does then one recognize whether the people running the business are intelligent and not dumb? inability to delegate, thereby curtailing growth. The company has negligible debt, they have net cash & current investments to the tune of 112 Cr at the end of FY16. One look at the return on capital (ROIC) over the years will point that there is quality in growth. The average pretax ROIC for FY09-16 is 33%, and the average ROE for the same period is 22%. The company is completely focused on developing the business in the same form to the other parts of the country, there are no signs of DIWORSEFICATION. Mr. Arun is a veteran in the amusement park business, he was the one who spearheaded the Bangalore project and recently also set up the Hyderabad park. The company in their latest concall also has said that they have hired senior talent to help them run the business, this shows that they are willing to bring professionals to run the business. Looking above one can say that the promoters of Wonderla Holidays Ltd are intelligent fanatics. In this section, I am going to cover the financial statement analysis of the company. In addition, I will also speak about the return on capital (ROIC) and the return on equity (ROE) in detail. These are two most important ratios an investor must understand and spot what are driving these. The income from operations (services + products) has increased at CAGR of 18% during the period FY11-16. Total income from operations stood at 205 Cr at the end of FY16. Sale of services primarily consists of entry fee collection, other heads of income in this section are room rent collection from the resort, the share of restaurant and shop revenue and other counter collections. Sale of products consists of the sale of merchandise and food & beverages (F&B) at the park. Below is the chart showing the breakup of revenue from operations for FY16. 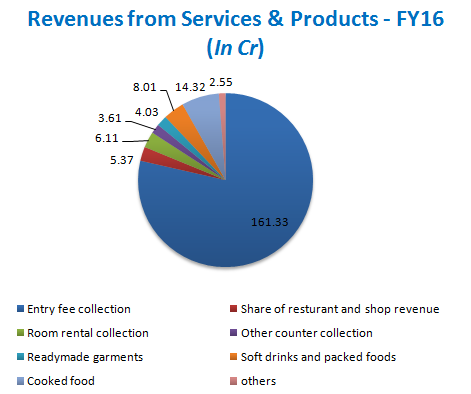 79% of the revenue is contributed from entry fee collection, service revenue stands at 86% of the total revenues from operations for the year-end FY16. Products contribute 14% to the total revenue mix, with cooked food contributing the highest share at 7%. The total footfalls at both the Kochi and Bangalore parks were 22.37 lakhs. The average ticket price for both the parks was 721 Rs, an increase of 17% over the previous year. The non-ticket revenue per person for both the parks was Rs 196 an increase of 24%. The average revenue per user (ARPU) for both the parks was 917 Rs. The breakup park wise is given below. The operating revenues (EBIT) have increased at CAGR of 16% over the period of FY11-16, from 34 Cr to 70 Cr. This has grown slower than the top line because in the same period employee expenses have increased by 18% CAGR and other expenses have increased by 25% CAGR. The PAT has grown at 14% CAGR for same period FY11-16, from 31.5 Cr to 59.8 Cr. There was an extraordinary gain in the year 2011 for 11 Cr which inflated the PAT for that year. If adjusted for that then the CAGR PAT growth for the FY11-16 period is 24%. Other income consisting mainly of treasury income has played a significant role in the company posting PAT growth greater than top line growth. The average EBIT margins for the period FY09-16 was 34% and PAT margins for the same period were 25%. The EBIT and PAT at the end of FY16 were 70 Cr and 60 Cr respectively. In the latest concall when Mr. Arun Chittilappilly was asked about what are the important metrics that the management looks at, he said that the Holy Grail in the amusement park business is footfalls, non-ticket revenues and ticket price hikes. In view of this, I am going to cover these aspects in this section. Below is the snapshot of footfalls of the both the parks from 2011. It is a bit concerning to see that the 5YR CAGR growth in footfalls in Kochi is -1% and for Bangalore, it is a healthy 5%. The growth of footfalls in parks across the world is 2-3%. The management in its recent concall has indicated that they see footfall to grow in the range of 4-5% over a long period of time. The management in its latest concall has also expressed that marketing efforts will drive the footfalls at parks. The management recently has prepared a video to advertise for the Kochi park, this is the first time in the history of the company that they have advertised through this form rather than print or other traditional forms of media. Below is the snapshot of revenues from the Kochi and Bangalore parks. These are both ticket and non-ticket revenues. One can see from the below figure that revenues have grown at a healthy rate. The Kochi revenues have grown at 5YR CAGR growth of 13% and the Bangalore revenues at 19%. The 3YR CAGR growth rate in resort revenues is 21%. The average revenue per user (ARPU) has grown at 15% for the Kochi park from Rs 390 in 2011 to 776 in 2016 and 13% for the Bangalore park from 522 in 2011 to 955 in 2016 for the 5YR period. The combined ARPU from both the Kochi and Bangalore park has grown at 15% from 450 to 918. I have broken down the ticket and non-ticket revenues for both the parks and the findings are as below. The average ticket price for both the Kochi and Bangalore park has increased by 14% CAGR for the FY12-16 period from 434 to 721. The non-ticket revenue for both the parks for the same period has grown at an impressive 31%. The ARPU has grown at 16% from Rs 500 to Rs 918. Currently, non ticket revenue is a very small portion of the overall revenues, it is about 20%. Global parks get about 35% from ticket collection compared to 75-80% for Indian parks. See below chart for revenue breakup of Indian versus global parks. Total revenues that it reports currently. The management in concall has been highlighting that they would want F&B and resorts to contribute more to the revenue mix. The management has also expressed interest to set up a resort at Kochi and would do so in the future in its new parks provided it has the required footfalls. The assets that a company owns are funded by liabilities and owner’s equity. In the case of Wonderla Holidays Ltd for the year ending FY16, 89% of the assets are funded by owner’s equity and 2% by trade payables. The company has about 5 Cr of long-term liabilities, which is 1% of the total liability and owner’s equity section. The debt to equity ratio was 0.01 at the end of FY16. The business is a fixed asset heavy business, meaning fixed assets form a major part of the total assets of the firm. At the end of FY16, 72% of the assets that the company held were noncurrent. Tangible assets formed 34% of the total assets and capital work in progress 35%. The capital work in progress would have been moved into fixed assets as it mainly pertains to the Hyderabad park and the park is operational since Q1FY17. Current assets formed 28% of the total assets, with current investments and cash & cash equivalents forming 25%. It is clearly evident that the company is not working capital intensive. The cash conversion cycle is -43 days, the cash conversion cycle is calculated as receivable days + Inventor days – payable days. 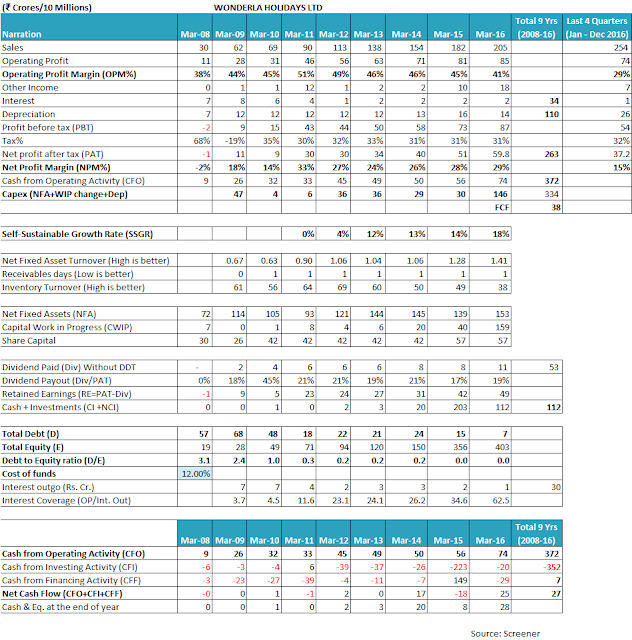 For FY16 the cash conversion cycle is 1.4+48-92 = -43 days. This means that the creditors of the company are funding the working capital of the company. The company has current investments and cash & cash equivalents to the tune of 112 Cr at the end of FY16. As mentioned earlier the company is a fixed asset heavy business and hence one important ratio that an investor needs to look at is the fixed asset turnover ratio. This is calculated as sales/fixed assets and this was at 0.66 at the end of FY16 as compared to 1.02 in the previous year. This is a temporary situation as assets for constructing the Hyderabad park have been brought to the balance sheet and sales for the same have to kick start. According to the management, it takes 3-4 years for a new park to be profitable at the PAT level. The net operating assets of the company (operating assets – operating liabilities) at the end of FY16 were 290 Cr, I have excluded the financial assets & financial obligations from the same as these are financing activities. The company has net financial assets to the tune of 107 Cr at the end of FY16. The pretax ROIC calculated as EBIT/Invested capital, invested capital. In this case, is net operating assets and EBIT is taken from the P&L. The pretax ROIC at the end of FY16 was 24%, lowest in six years. The reason as mentioned above is the fall in capital turnover, which is a temporary situation and this ratio should improve once sales from Hyderabad park kick in. The average pretax ROIC for the period FY09-16 was 33%. The ROE at the end of FY16 was 14%. I will cover the ROE & ROIC in detail ahead of this report. One very important financial statement is the cash flow statement and investors usually do not pay much attention to it. An investor ignoring the cash flow statement is doing so at her peril. The cash flow statement can be divided into three namely a) cash flow from operations b) cash flow from investing activities and c) cash flow from financing activities. Special attention needs to be given to cash flow from operations (CFO), this is also called as the cash profits. This is the cash that the company generates from running the day to day operations of the business. It is very important for the company to generate healthy CFO, as it is with this that the company further invests in assets for growth. If a company is not able to generate positive and healthy CFO, then it will not be able to invest in assets and will have to borrow to fund the new assets. One can see that the CFO, cash profits are higher than the accounting profits reported. This is a very good sign. This means that the company is generating more money that what it is reporting as PAT in the P&L. What is causing this? One look at the detailed cash flow statement gives the details. Depreciation of about 14 Cr is added back as it is a non-cash expense. As mentioned earlier the company is not a working capital intensive business. Look at the adjustments in working capital, there is a very small increase in inventories and receivables and payables and other liabilities have increased by 18.67 Cr which has increased the CFO. The free cash flow (FCF) = Cash flow from operations – cash flow from investing activities is also positive. The FCF at the end of FY16 was 54 Cr, the free cash flow is used to reduce debt and pay dividends to shareholders. The difference between FCF and cash flow from financing activities is the increase/decrease in cash for that year. This amount is adjusted with the opening cash balance to get the closing cash balance. The increase in cash was 25 Cr at the end of FY16 and closing cash balance stood at 28 Cr. Two important ratios that an investor must compulsorily analyze is the return on invested capital (ROIC) and return on equity (ROE). The investor must also dig deep to find out what is driving these ratios. In this case, if there is positive spread between RNOA and RNFA, it reduces the ROCE. The reason for it being that shareholder’s funds is invested in financial assets and if the financial assets earn less than the operating assets, ROCE is less than the RNOA. Let us apply the same to Wonderla Holidays Ltd and see where the company stands. Find below the snapshot of ROE for Wonderla Holidays Ltd.
Return on net operating assets /ROIC is the first part of analyzing the ROE. ROIC is driven by operating margins, which is calculated as EBIT/Sales and capital turnover, calculated as Sales/ Invested capital (net operating assets). The operating margins of the company at the end of FY16 were 34% not much change as compared to the previous year. The asset turnover has fallen to 0.77 from 1.11; the reason for the same has been explained earlier. The post-tax ROIC stood at 17%. The company has net financial assets and as explained earlier the ROE of a company having net assets is reduced as usually financial assets earn less than the operating assets. The company had net financial assets to the tune of 107 Cr at the end of FY16 and financial leverage was 0.27. The company earned an average of 5% on its assets, calculations of the same have been shown above. About 3% points are reduced from the ROIC to arrive at the ROE. The ROE of the company stands at 14%. Wonderla Holidays Ltd comes out with flying colors after looking the above financial analysis. The company has no debt, strong balance sheet, growing its topline at a respectable pace, the growth is profitable as evident from the healthy ROIC’S and ROE’S. The company is reporting healthy cash flows, also indicating that any future expansions can be done with internal accruals. The company scores very well on all the financial parameters. For the above, it is very clear than investors would do well to identify businesses which earn higher returns on capital. If the business earns 6% on capital and even if it reinvests everything in the business you are not going to make more than 6% return. Where does Wonderla Holidays Ltd fare on this parameter? The company’s pretax ROIC for FY16 was 24%, the average pretax ROIC for the period FY09-16 was 33%. The company comes out with flying colors on this parameter. The company is able to generate very healthy ROIC, in spite of the company operating in a fixed asset-heavy industry. It is also important for an investor to identify companies where they can deploy incremental capital at higher rates of return. 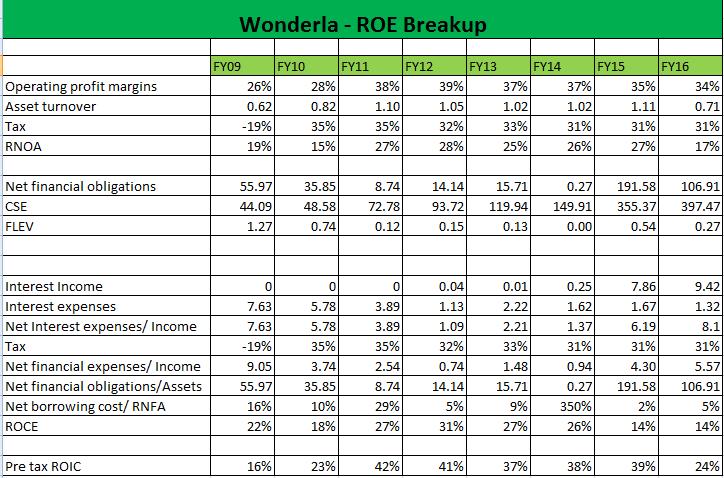 Can Wonderla Holidays Ltd then deploy additional capital at higher rates of return? They certainly have opportunities to do so. They want to spread their footprint across the country and good thing to note is that they want to do it one park at a time. Will they earn higher returns on capital on these investments? Only time will tell. However taking a cue from the past and looking at their record I think they would earn a decent return on this additional capital. As value investors, we need to figure out the intrinsic value of the company. What is the intrinsic value? Find below what Ben Graham and Warren Buffett have to say about intrinsic value. It is based on earnings power of the business. How much cash will as an owner of a business get after spending for capital expenditure for staying competitive? Buffett talks about owners earnings, which is different from accounting earnings. There are few adjustments made to reported earnings to arrive at owner’s earnings. The objective of making these adjustments is to figure out what cash will the owner get after such adjustments are made. Hence owner’s earnings are a better estimate of the earnings power of a company rather than accounting profits that the company reports. Finally, we as value investors need to also understand at what rate the intrinsic value will compound. So if a company earns 6% on capital and reinvests all its earnings, its intrinsic value will grow by only 6%. I am now going to apply the concepts that I have discussed above to value Wonderla Holidays Ltd. The owner’s earnings of Wonderla Holidays Ltd taking the FY16 figures come to 96 Cr. I am calculating the pretax owner’s earnings and hence I start with the EBIT. The company has no debt and interest expenses are negligible. working capital changes are added/subtracted depending on the movement of working capital in that year. In this case, working capital is added. Maintenance capex is reduced as this is the amount that the company must spend to stay in business, the management in its concall has stated that they have maintenance capex of 8-10 Cr per park, hence I have taken 25 Cr. I have added back 18 Cr as advertising expenses, which is the average 3 Yr advertising expenses. The current market cap of the company is 2100 Cr, one can also adjust for debt and cash and arrive at the enterprise value. In this case, the EV of the company is 1993 Cr. The company trades at 21-22 times owners earnings. One would be paying a 20X multiple to enter this business currently (assuming 20X although the business is trading at 21-22X, done for ease of calculation). The next step is to ascertain if it is ok to pay a 20X multiple for this business. Earlier I had mentioned as to how one can ascertain the intrinsic value compounding rate. Wonderla Holidays Ltd’s pretax ROIC for the period FY09-16 is 33% and dividend payout is 20% over the years, hence it ploughs back 80% of its earnings. If I assume that Wonderla Holidays Ltd can earn 30% ROIC and maintain the same reinvestment rate then its intrinsic value will compound by 30%*80% = 24%-25%. If 1$ of earnings grows at 25% for 10 years then the company will have 9.31 earnings at the end of 10 years (1*(1.25) ^10). I also assume that the ending multiple at the end of 10 years would be 15X. Hence the price after 10 years would be 9.31*15 = 140. So the return one can expect for a stock trading at 20X, growing intrinsic value by 25% and assuming an exit multiple/ending PE of 15X is 21% CAGR (140/20)^(1/10)-1). There would definitely be other ways to think about the valuations of Wonderla Holidays Ltd. These assumptions that I have used may or may not play out. After going through the business, Wonderla Holidays Ltd definitely looks like a wonderful business to be invested in. However one needs to ascertain what the fair value would be to enter this business. This is not a recommendation to buy/sell the stock. I do not hold in a personal capacity as of this writing. This is not a buy/sell/hold recommendation. This document is only for educational purpose. I am not a SEBI registered analyst. Please contact an authorized investment advisor for investment advice on this scrip. Thanks for sharing your analysis of Wonderla Holidays Ltd with the author and readers of the website. We appreciate the hard-work put in by you in the analysis. Your analysis stands out in terms of diligence with respect to the in-depth reading undertaken by you of various voluminous documents like DRHP, Annual reports along with other public resources like conference calls & their transcripts etc. We thank you on behalf of all the readers of our website as your write-up is a comprehensive work on Wonderla Holidays Ltd and any investor who wishes to start the analysis of the company would be able to commence on a very firm footing after reading your analysis. You have been able to cover the analysis of the company from multiple aspects like business & industry description, competitive advantages, management as well as valuation analysis. Any reader interested in knowing about Wonderla Holidays Ltd would find value in your analysis. Wonderla Holidays Ltd came out with its IPO in FY2015, therefore, the publicly available data contains financial details of last 9 years (FY2008-16). Let us analyse the performance of Wonderla Holidays Ltd over last 9 years. Wonderla Holidays Ltd, as mentioned by you, has been growing its sales at a good pace of 20-25% year on year for last 9 years (FY2008-16). The growth rate has been very good until now. Wonderla Holidays Ltd has operationalized a new amusement park at Hyderabad in March 2016, which the company expects to help it in maintaining the growth momentum for next few years. Moreover, the company has plans to start work on a new amusement park in Chennai, which would show visibility of growth once the revenues from Hyderabad reach towards maturity/optimal levels. 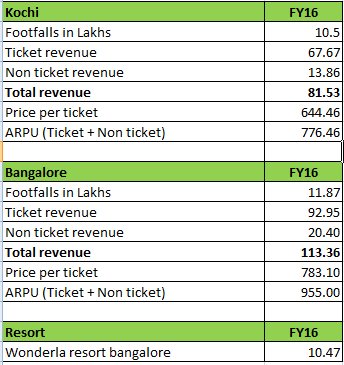 The revenue growth of Wonderla Holidays Ltd comes from operationalization of new parks, adding new rides in existing parks, annual price hikes, and focus on change in revenue mix from predominantly entry fees to food & beverages (F&B) etc. However, the most prominent factor, which is expected to contribute to the bulk of the growth going ahead would be new park additions. The current plans for the next park at Chennai seem to have faced some hurdles. As per the management conference call with analysts in February 2017, Wonderla Holidays Ltd disclosed that it is facing land acquisition problems due to legal challenges. An investor should monitor the developments related to the development of new parks closely to understand future growth prospects of the company. Wonderla Holidays Ltd has been able to maintain its profitability at a good level over the years. An investor would notice that it has been reporting operating profitability margins (OPM) exceeding 40% for the almost entire reported period (FY2008-16), barring FY2008. The operating profitability margins of Wonderla Holidays Ltd are the highest among the industry. 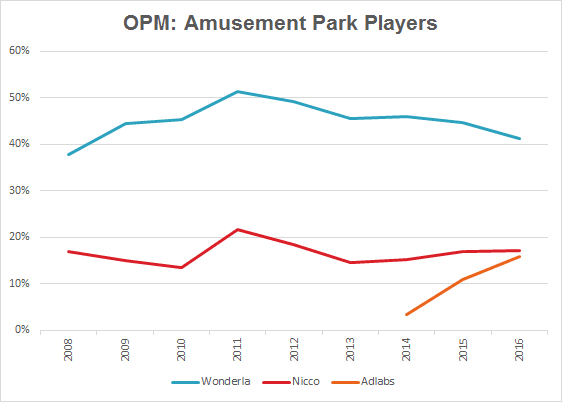 When we compare the OPM of the company with its listed peers: Adlabs Entertainment Ltd and Nicco Park and Resorts Ltd, then we notice that the OPM of Wonderla Holidays Ltd is much higher than the profitability of both the listed peers. Having an operating profitability margin higher than peers in a business, which is based on branding and customer service is one of the evidence of the competitive advantage of the company. However, the investor would also notice that the OPM of Wonderla Holidays Ltd has been witnessing steady decline over the years and have reduced from 51% in FY2011 to 41% in FY2016. The trend in the decline in OPM has been accentuated in the current financial year (FY2017), when the company has reported OPM of 20% and 19% in Sept 2016 and December 2016 quarters respectively. The company has clarified that the reduction in OPM is on account of higher employee costs due to the operationalization of new park at Hyderabad, provisioning for disputed taxes and most importantly on account of higher marketing spend especially in Hyderabad. While reading through the conference call transcript of February 2017, the investor would realize that Wonderla Holidays Ltd has done mistakes about its pricing strategy related to opening months of Hyderabad Park by giving higher discounts, which spoiled the customer experience as it resulted in overcrowding of the park. The poor customer experience has impacted the company reputation in Hyderabad, which the company has acknowledged to the stakeholders. As a result, now Wonderla Holidays Ltd has to do significantly higher marketing spends in Hyderabad including video mode of advertising, which is very costly and was not being done by the company in the past. In the past, the company has stuck to print/still mode of advertising. The footfalls in the Hyderabad seem to have improved, however, as highlighted in the above sections of the conference call, the company seems to have toned down its footfall expectations in Hyderabad in FY2017 from earlier 7 lac to now 6 lac. Moreover, the higher advertising spend along with other factors has led to the operating profitability margins falling drastically to 19% in December 2016 quarter, which is more in line with the OPM of its peers (Nicco and Adlabs). An investor should keep a close watch on the operating margins of the company going ahead to monitor whether the company is able to recover to its previously high OPM levels or the current levels would become the new normal. As mentioned by you in the write-up, an investor would appreciate that Wonderla Holidays Ltd operates in a business, where the existence of an amusement park in a locality gives the existing owner huge competitive advantage. Other players usually do not come up with competing parks within the catchment area of an existing park. In such an insulated business scenario, more often than not, it is the existing player on its own who is primarily responsible for its poor performance if any. Therefore, an investor would need to track the company’s actions and their impacts as it is most probable that the fault would lie within the decisions of the company itself. While going through the conference call of February 2017, the investor would notice that the company has got its pricing wrong in Bangalore Park as well. The customer would notice that in Hyderabad Park, the low pricing of tickets has impacted the customer experience whereas, in the Bangalore park, it is the higher pricing of water park costumes, which is impacting the customer experience. It is a good sign that the company has identified and acknowledged its issues on both the locations and has taken/plans to take remedial steps to improve the customers’ experience. Nevertheless, an investor should keep it in mind that for such insulated businesses, the origination of the problems mostly starts from within the company and its decisions and less from outside. Even if the companies in such businesses are not able to expand in terms of new parks, they can always show a decent growth only from incremental additions in the existing parks and inflation-linked price hikes provided they keep on managing their operations efficiently. As with the OPM, the net profit margin (NPM) of Wonderla Holidays Ltd is also at a good level of 25-29% over the years and has witnessed a decline to 6% in Sept 2016 and Dec 2016 quarters. We advise that the investors keep monitoring the profitability margins of Wonderla Holidays Ltd going ahead. Over the years, Wonderla Holidays Ltd has a tax payout ratio of over 30%, which is in line with the corporate tax rate prevailing in India. While assessing the operating efficiency parameters, an investor would notice that Wonderla Holidays Ltd has a very low net fixed asset turnover (NFAT) over the years. NFAT used to be less than one until FY2011 and has since improved to 1.41 in FY2016 as it used its existing parks at Bangalore and Cochin more efficiently and produced higher revenues from these assets. However, with the operationalization of Hyderabad park the NFAT at Sept 30, 2016, has again fallen less than one as the assets of Hyderabad park, which were shown as part of capital work in progress (CWIP) on March 31, 2016, are now part of fixed assets at Sept 30, 2016. At Sept 30, 2016, the fixed assets stand at ₹318 cr. whereas the revenue of last 12 months (Oct 2015 – Sept 2016) is ₹234 cr. NFAT of less than one is a very precarious situation for any company as it indicates that for generating additional sales growth of ₹1, the company needs to invest more than ₹1 in new fixed assets. The same has been true for its established parks e.g. at Bangalore as well as the newly launched park at Hyderabad. Q3-FY2017 results presentation of Wonderla Holidays Ltd reflects that the Bangalore park is generating a revenue of about ₹30 cr. per quarter, which is about ₹120 cr. per annum. As mentioned by the company every new park costs about ₹250-300 cr. of investment including land. Such heavy capital investment for generating every rupee of incremental sales puts companies in the very precarious situation. It is essential that such companies earn high profitability on every rupee of revenue generated by the heavy capital investment done by it. Otherwise, it is very likely that the companies would either have to leverage themselves (or resort to equity dilution) to meet the future growth requirements (new parks) or they would have to remain content without doing additional capex to maintain the balance sheet strength. An investor would notice that Wonderla Holidays Ltd is generating an average CFO of about ₹55 cr over last 5 years (FY2012-16) when its two mature parks (Bangalore and Cochin) have been functioning. Assuming ₹8-10 cr. of maintenance capex of each park, Wonderla Holidays Ltd would have to spend about ₹20 cr on maintenance capex of Bangalore and Cochin parks and it would have saved about ₹35 cr. each year for new capex (Hyderabad park) for last 5 years. A rough calculation shows us that Wonderla Holidays Ltd would have funded the ₹250 cr. for the Hyderabad park by way of ₹175 cr. of internal accruals (₹35 cr * 5) and the balance ₹75 cr. from the IPO proceeds of ₹180 cr. (IPO in FY2015). This leaves the company with about 105 cr. of IPO proceeds, which it may use for Chennai park. An investor would notice that the funding through the IPO proceeds helped Wonderla Holidays Ltd maintain its near debt-free position, otherwise, the company would have to bridge the gap between the cost of the Hyderabad park and the internal accruals through debt.Moreover, it is not that the IPO did not have any cost for the company. As per the FY2015 annual report, the company paid ₹11.25 cr. as IPO charges to various parties like merchant bankers, which is about 6.25% of the total IPO size (= 11.25/180). 6.25% as fee/charges is a significant amount of commission to be paid for raising money. Such a situation of raising high-cost IPO funds arose during the times the company was generating very good OPM of about 45% consistently during FY2012-16. The proposed park at Chennai, as per management, is expected to cost about ₹300 cr. At Sept 30, 2016, Wonderla Holidays Ltd had a cash + current investment balance of about ₹82 cr. So the company needs to generate the balance about ₹220 cr. from internal accrual over next 3 years, if the company is to complete the park by Sept 2019. We have noticed above that two mature parks (Bangalore and Cochin) are generating about ₹35 cr. of total FCF (i.e. about ₹17 cr. per park) per year. Assuming early optimal utilization of Hyderabad park and same 45% OPM, the company might generate about ₹50 cr. of FCF (post maintenance capex of all the parks) each year, which would have generated about ₹150 cr. the worth of internal accruals (assuming 45% OPM) over next 3 years to fund the development of Chennai park. The balance ₹70 cr needs to be raised by additional debt/equity dilution. The gap of ₹70 cr. in the financial closure from remaining IPO proceeds and internal accruals is assuming OPM of 45% for each park. 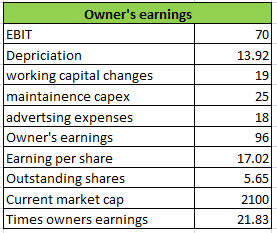 However, as we have noticed that since last 2 quarters, the OPM of Wonderla Holidays Ltd has drastically come down to about 20%, therefore, it becomes essential that the company recover its profitability in a timely manner otherwise, the financial gap would increase significantly and the current strength of the balance sheet would not remain at the same levels. Investors also need to keep in mind that the Chennai project is currently facing land acquisition related challenges and any delay might add to the cost of the project and as a result, the funding gap. The above analysis would indicate to investors that it is essential for companies with low NFAT to earn high profitability, otherwise, maintaining the balance sheet strength becomes a challenge and we might see companies falling into a debt trap in order to chase non-profitable debt-funded capital intensive growth. It is also essential that companies operating in capital intensive business manage their working capital very efficiently. This is because even if the company reports high profitability numbers but if these profits are not converted into cash and are stuck in inventory and receivables, then the company would be facing a cash crunch and would again fall into debt seeking environment. In the case of Wonderla Holidays Ltd, it is a good characteristic of the business that the sales of the company are on advance/cash payment basis and do not involve credit sales. This is the reason that the company reports the very low level of receivables (₹1 cr.) when compared to sales of ₹205 cr. in FY2016. Similarly, the company does not need to keep a lot of inventory on its books as most of its business operation/services are the rides, which are fixed assets. Such business characteristics put the company in an advantageous position from the perspective of cash flow management. We can see that over last 9 years (FY2008-16), the company has reported cumulative cash from operations (cCFO) of about ₹372 cr. against cumulative net profit after tax (cPAT) of ₹263 cr. over the same period indicating that entire profits have been converted into cash. With working capital situation under control, Wonderla Holidays Ltd only needs to keep operating its fixed assets (parks) operating efficiently and with high profitability margins. Wonderla Holidays Ltd is currently available at a P/E ratio of about 56 (based on TTM EPS), which does not offer any margin of safety in the purchase price as described by Benjamin Graham in his book The Intelligent Investor. If we look at the prevailing P/E ratio (56) of Wonderla Holidays Ltd, from the approach to valuation that we follow while assessing the investable P/E ratio of stocks, then we realize that the P/E of 56 is at a very high level than what we would have been willing to pay for the company. We do not use parameters like ROE, ROIC and owner’s earnings in our stock analysis approach, therefore, we would not be able to provide our inputs on the same. In your assessment, you have assumed Free cash flow (FCF) = CFO – CFI, whereas in our assessment, we assume FCF = CFO – Capital Expenditure. Capital expenditure is a part of CFI, however, there are other items like increase or decrease in current investments, dividend income etc. which are part of CFI, which we do not adjust while calculating FCF. Overall, Wonderla Holidays Ltd seems to be a company growing at a decent pace despite being in a capital intensive business as its growth had been associated with high profitability margins and healthy cash collections from business operations. The company could maintain a strong balance sheet as it funded the gap in the capex for Hyderabad park through IPO proceeds rather than going for debt funding. The above analysis indicates that going ahead in all probability, the remaining cash from the IPO proceeds and the internal accruals from existing park operations would not suffice for meeting the financial closure requirement of Chennai park and the company might have to resort to debt/further equity dilution in future. The current healthy balance sheet of the company along with good credit rating of AA- (ICRA, August 2016), would ensure that the company might not face any challenge in raising the debt to achieve the financial closure for the Chennai park. In light of such a situation maintaining a high profitability, margin is mandatory for the company to keep the strength of the balance sheet intact. Therefore, the declining profitability margins of recent quarters are a cause of concern and need to be tracked closely by investors. These are my views about Wonderla Holidays Ltd. However, you should do your own analysis before taking any investment related decision about Wonderla Holidays Ltd.